Very beautiful poster. 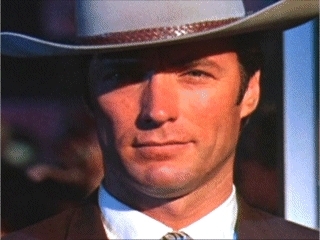 Astonishing to see only Eastwood at the head of affiiche. The other stars of the film appear only in small print in the credits file, under the road. Beautiful poster in which Clint’s face almost disappears in the grey sky. I like Clint Eastwood movies’ posters which are like paintings. When I look at The Mule’s poster, I think about Pale Rider, Heartbreak Ridge, White Hunter Black Heart, Absolute Power or True Crime ones, because of Clint’s face who seems to come from the shadow or the darkness. That is one cool poster... and tv spot. I love the official poster and trailer. The fan poster is ok, but I’d prefer to see Clint’s classic, iconic, legendary squint. I can’t remember ever seeing an Eastwood movie opening day. Through connections I’ve seen a number of sneak previews before general release. As for The Mule, I plan on having tickets in advance for opening day. It is exciting that they are recording the score and it sounds like it could be great! How could the MPAA rate the film Rated R without a score? Doesn't this indicate that the film wasn't finished at the time of the rating? Is this typical? According to the B.B.F.C. (British Board of Film Classification ) , The Mule trailer 2 has been passed......running time 1m 30sec. Poster is awesome as is usually the case for Eastwood movies. Looks like there are a few new scenes shown in that tv trailer. Interesting. I’d like to see that new trailer. On the other hand, I don’t want The Mule to be too much unveiled. Since the first trailer and the poster came out, little has been said about The Mule. I don’t know if there will be a special screening in AFI film festival, for instance. Warner Bros seems to keep a low profile. The Mule is considered as an unknown outsider for the Oscars. Since the trailer discussed by Macpherson has not been released and I was curious about why, I contacted trailertrack to inquire about a new trailer. He says that this trailer is a shortened version of the previous trailer and not a new trailer. He also said that movies like this typically only have one trailer and that he hasn't heard anything about an upcoming trailer for "The Mule." In many ways, I think that we have all we need in the first trailer, though it’s not really talkative. A second trailer may spoil everything. Maybe other TV spots will appear few weeks before The Mule is released in theaters. If you remember, for Jersey Boys, American Sniper, Sully and The 15:17 to Paris, some interviews and footage of the shooting were posted by Warner Bros on internet, before the movies came out. Maybe it will be the same for The Mule. Traditionnally, there’s no big publicity for Clint Eastwood movies. For instance, in Paris, France, Clint Eastwood movies’ posters are in the streets and public areas, two weeks before the release date only. The Mule is actually released on January 23 in France. I hope reading great interviews and articles when The Mule is released. After The Mule, what’s next for Clint ? It seems that Impossible Odds is out. Isn’t it ? Is everyone seeing these ads on TV by now? I really haven't seen them yet. The advertising for this is really intriguing to me. From the trailer, it's tough for me to tell whether this film is primarily more of a family drama, or more of a crime drama/thriller? The trailer kind of makes it seem like "The Mule" is part of a trilogy of films that are really love stories/family dramas disguised superficially as something else. This one happens to revolve around drug running, kind of like how "Million Dollar Baby" revolved around boxing, but was at its heart a love story, and "Gran Torino" revolved around gang violence, but was, at its heart, a paternal love story between Thao and Walt. Or, alternatively, is "The Mule" primarily a thriller/crime drama which includes a secondary subplot of family drama? This is one of the unanswered questions that I'll be looking forward to answering when I eventually do see the film. What say you, esteemed board members? Very good post, AKA23 ! Actually, I asked myself the same question about Trouble with the Curve before it came out. Million Dollar Baby and Gran Torino are love stories/family dramas disguised as something else, as you said. Trouble with the Curve is a paternal love story between Gus Lobel and his daughter. Trouble with the Curve revolved around scouting a baseball player. At first, I thought that Million Dollar Baby, Gran Torino and Trouble with the Curve could be a non official trilogy. But Trouble with the Curve was not directed by Clint and wasn’t as good as Million Dollar Baby and Gran Torino. So, I gave up that thought or idea. I still think that Million Dollar Baby and Gran Torino are pretty close. Trouble with the Curve is still enjoyable but quite disappointing at the same time. I think that Clint and Amy Adams performances were ruined by the script, which was a little bit boring and lazy. Now, like you, AKA23, I think that The Mule could join Million Dollar Baby and Gran Torino and be part of a trilogy. I think that The Mule could be half a family drama and half a thriller/crime drama. Absolute Power had this formula, if you remember. I don’t expect a lot of action sequences. Maybe some shootouts and some car chasing. My question is: how close to the real Leo Sharp story will The Mule be ? I saw the trailer and the TV spot you posted previously. The TV spot didn’t give more informations than the trailer. I just hope that it won’t be an other Trouble with the Curve ! About its Oscar chances, I don’t know. The Best Actor category seems to be tough and suspenseful this year. So, let’s wait for the first reviews and above all, the film itself.